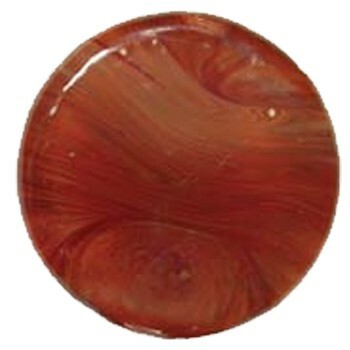 Rootbeer is a striking red that can yield numerous effects ranging from rich blues and purples to reds and earthy browns. Rootbeer is well suited for sculpture and blown work of all thickness. It can be kiln or flame struck. It strikes more quickly than any other striking reds, so plan carefully. Work in a neutral to oxidizing flame to keep it from developing any liveriness. Try it with a backing of C3-65 Cherry. It also looks great with cased with C3-13 Amber/Purple. Refer to Northstar Newsletter issue 21 for additional information.